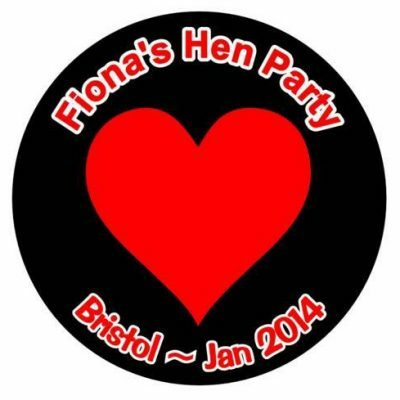 Celebrating a Hen Party, Stag Night or Birthday ? Then you need something that is personal to your event. 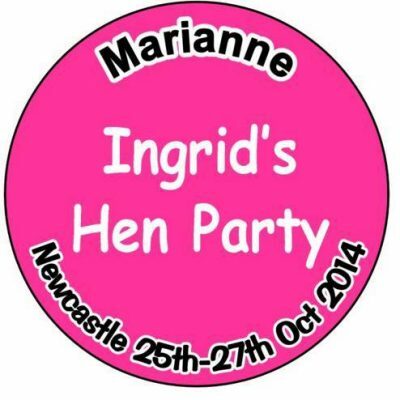 See our hen party badge ideas here. 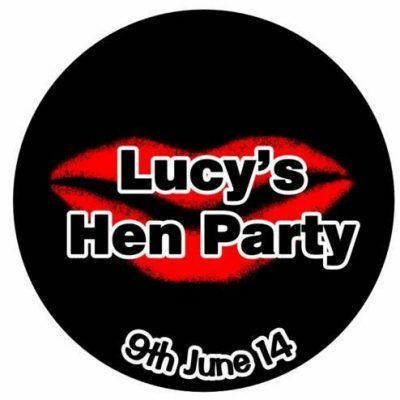 Let us help you decide exactly what you need for your perfect party accessories, with our extensive range of Hen Party Badges and Rosettes as well as our printed ribbon range for Sashes, Lanyards and Wristbands. 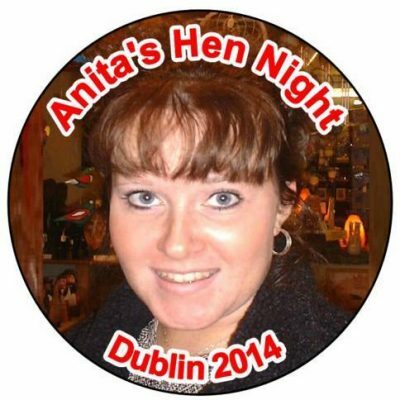 We are here to help you with some hen party badge ideas. If it's design ideas you need - then we have pages of design suggestions. .......then have a look around our site or contact us with your requirements. Organising a party is difficult enough, but when you also have to organise the accessories to go with the party theme then this is the time when you need a little additional help. 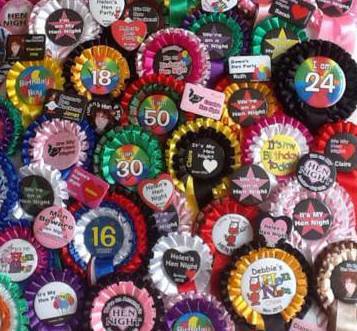 On this site you will find a wide selection of hen party badge ideas, hen night sashes and customised rosettes - each one hand made by us and personalised to your exact requirements. Whether you are the Bride, the Chief Bridesmaid, Maid of Honour or friend who has a Hen Night to plan, or whether you are a relative or friend trying to organise a birthday party then hopefully on the following pages you will be able to find some good ideas to help you make the day a successful event that everyone will remember. We have been helping party organisers to add the finishing touches to their party celebrations since 2000, and during this time we have been involved in thousands of events from destinations as far away as the West Coast of the USA and South East Australia to ones that were talking place in our own village. 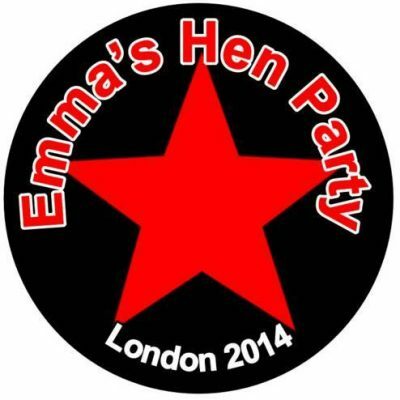 Increasingly , there is a trend for parties to be themed or planned to co-ordinate to a certain colour scheme. 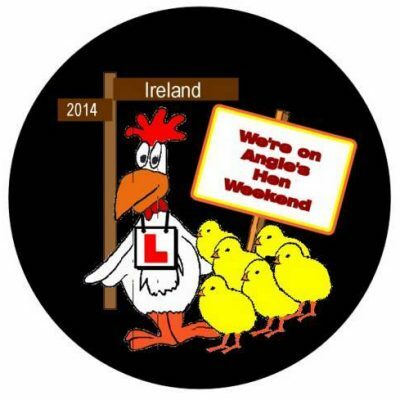 In this case our personalised badges and rosettes are an ideal accessory. 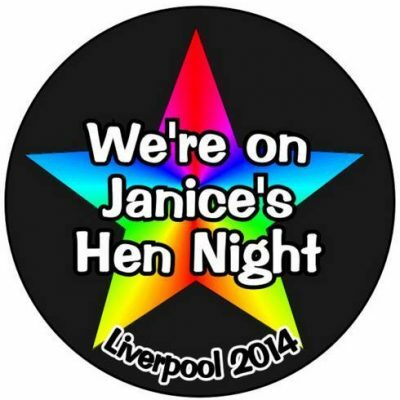 We can amend the background colour of any of our hen night badges, change the wording to suit your event, and, if you are also having rosettes (either for everyone or just for the bride or birthday boy or girl) then we can produce these with a ribbon colour (or colours) to match We also have a selection of sample badge ideas available that will help you to firm-up your design ideas. 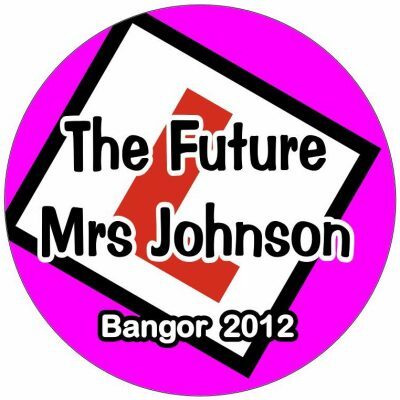 If you want to personalise one of these designs so that it is customised to your event then you can order these on line now. Just follow the links at the top of the page to view our on line shop. If you want something a little different then just send us an email with your requirements and we will let you have a quotation within 24 hours. 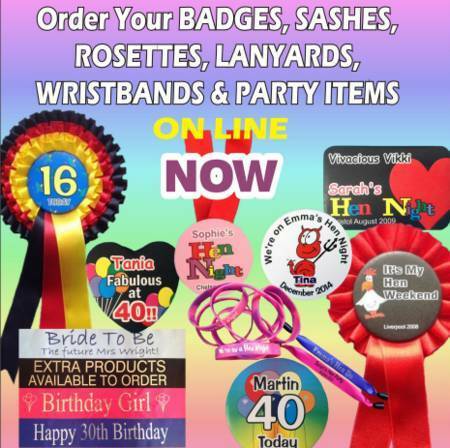 The same degree of customising also can be applied to the other products in our range as well as our hen night badges - our customised printed sashes, ribbon badges, customised lanyards and silicone wristbands. Each one can be designed and colour-coordinated to suit your theme. If you have any questions that you want to ask, before you place an order with us, then we are always more than happy to either respond to emails or to take phone calls. We are normally contactable 7 days a week and often until the early evening. Just contact us and we will try and help. Our aim is to have all orders ready for posting within 24 hours of receipt. 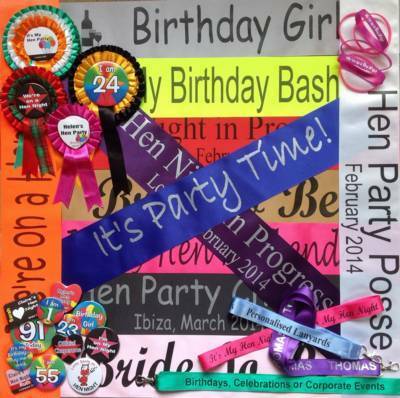 The hen night badges, rosettes, sashes and ribbon lanyards are hand made by us, so we have total control of the order progress and product quality during its progress through the ord er process. Our orders are normally sent out by First Class post which in most cases means that you get the order next day. To be certain however, we would always recommend that you use the guaranteed Next Day delivery option, which will ensure your order is received on time. All our prices are in UK £ Sterling. The designs and layouts on the site are there for your guidance. If you like what you see then these designs can be used as a template for your own design, which will allow you to order on line today. 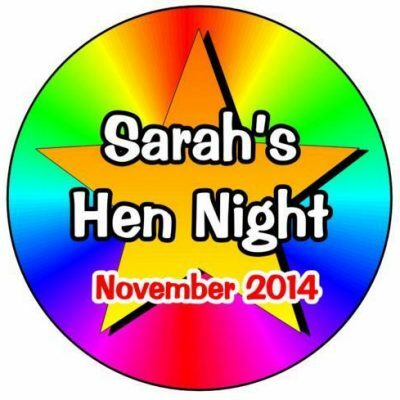 However, the final design is yours - its your personalised badge or rosette etc that you are ordering. So if you don't see exactly what you want then just send us an email or fill ion our enquiry form and we will send you a quotation. We will respond usually within 12 hours - usually much quicker - and the whole process will not take much longer than ordering on line. Once you have decided on your party wear then you might want to look at some of our other product from this site, which include hand made chess sets - perfect for birthdays and retirement gifts and personalised baby wear - which is a great idea for the younger guests at wedding receptions and family birthday parties. 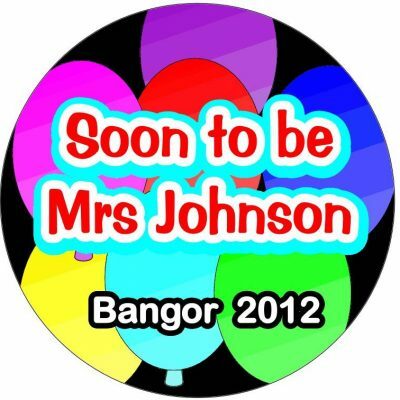 Party Badges, Ribbon Badges, Customised Rosettes, Custom Printed Sashes, Lanyards, Silicone Wristbands and Badge Packs. or Android - menu button - then bookmark - add to home screen. You will then get an icon on your mobile desktop which when clicked will take you direct to our site.